Artwork Panel: 28.2cm x 41.5cm ≈ 11" x 16¼"
Silk/Brocade: 37.3cm x 103.5cm ≈ 14¾" x 40¾"
This depicts the Samurai Takechi Mitsuhide holding a bow staff and fully armed for battle. Note: There is some dispute as to whether 武知 should be pronounced Buchi or Takechi. This is a fine art giclee reproduction of a very old Japanese woodblock print. This was made months ago, rather than centuries ago. Printed on handmade kozo (mulberry) paper (the same kind of paper the original print was made with). Original artist: Utagawa, Kunisada (1823-1880). 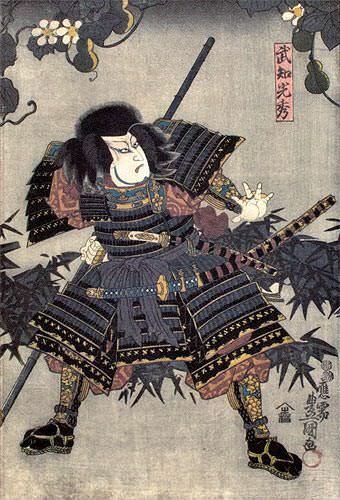 Original woodblock was created in Japan, around 1848.